Out in the West during spring and fall it is cattle moving time. 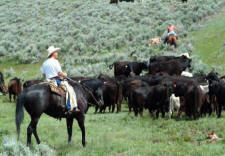 Large herds of cattle need to be driven between the summer and winter range, or moved for shipping. On a cattle drive you might be traveling 6 to 12 miles a day in a straight line, but you will have ridden three times that much bringing in the strays from the flanks. The evenings are a very special time around the campfire. It's still like it was a hundred years ago. Cattle drives are a time where you can get back to life's essentials, and where friendships are formed. The horse riding pace on cattle drives is usually slow and accommodations mostly quite basic in tents. The well-trained horses, the romance and the very special ambiance of cattle drive trips make it a wonderful experience. You like the working ranch idea, but you really want to work cattle a lot. Well, a Round Up will definitely give you that opportunity. Every spring and fall ranchers prepare their cattle to be moved to the summer or winter range and the calves need to be sorted, separated, marked and shipped. Round ups are a time for lots of activities and work at the ranch. You can get a real inside view of the day to day ranch work. On a round up be prepared to put in long hours, break a sweat here and there and feel real good about yourself at the end of your stay. Also many of our South America destinations have cattle round up options - like our estancias in Argentina or Ecuador. Cattle Drives horseback riding holidays.